Starring Sophia Lillis, Linda Lavin, Sam Trammell, Zoe Renee, Mackenzie Graham, Laura Slade Wiggins, Andrea Anders, Jesse C. Boyd, Jay DeVon Johnson, Andrew Matthew Welch, Jon Briddell, Josh Daugherty, Evan Castelloe, Jennifer Riker, Melanie Leanne Miller, James William Ballard, Ayanna Wardlow, Shaun Bowman and Linzy Clifton. Screenplay by Nina Fiore and John Herrera. Distributed by Warner Bros. Pictures. 89 minutes. Rated PG. It’s kind of nice to know in a crazy, intense world where even children’s literature embraces depression, dystopia, murder, suicide, monsters, mental illness and the like, there is still a place in the world for Nancy Drew. You remember Nancy Drew, don’t you? Smart and perky teen sleuth who has been solving mysteries in hundreds of books since 1930. Beyond the books, Drew has been on TV or in theaters on and off for decades – the last movie was the 2007 Nancy Drew with Emma Roberts as the titular teen sleuth. Not only that, she is the star of dozens of popular computer games over the last few decades. And now she is back in the cinemas again, doing a film based (somewhat loosely) on the second book in the series – which was also made into a film in 1939. Oh sure, the new Nancy Drew and the Hidden Staircase does a few things to make it palatable for the kids of a new generation – adding selfies, texting, high-school castes, longboard riding, cyberbullying, Facetime, Instagram and the like. They even made the lead character much more of a rebel, willing to bend and even break the occasional law in order to follow a lead. Actually, as her lawyer father (Sam Trammell) points out, she commits several felonies, even if she is doing it for the right reasons. However, perhaps that was all for naught. In my experience, anyway – seeing the film at an afternoon showing during the opening weekend – there were significantly more middle-aged viewers there for a nostalgic fix than the children and young adults that the movie is supposedly aimed towards. Granted, that is just one theater and one showing, but it was still a bit of a surprise. Maybe not that much of a surprise, as the filmmakers (which include Ellen DeGeneres) seem to be doing their best to sneak in the nostalgia market. I mean, look at the movie poster – it doesn’t get much more old-fashioned looking than that. And as an adult man, I am only seeing it for the nostalgia factor, and I didn’t even read many Nancy Drew mysteries. (I was a Hardy Boys guy.) However, I have a niece in the age demographic of Nancy and her friends, and I think she would enjoy it simply as a tween-aged mystery caper. And I guess I knew from the get-go that Warner Brothers didn’t have a huge stake in making this movie – hell, the biggest “name” in the cast is Linda Lavin. However, it’s kind of a shame that Nancy Drew and the Hidden Staircase is getting such a bum’s rush. It’s particularly a shame because Sophia Lillis – best known as Beverly, the one girl in the gang from the hit horror film It – really nails the character. She is able to straddle both the old-fashioned and new aspects of the story (as she does with It, by the way), and sells the character and the story with ease. The story – which revolves around such typical Nancy Drew subjects as a possibly haunted house and a bunch of crooks trying to hustle cash from the possible building of a railroad line through their home town – is sort of silly, but that’s okay. You don’t go into Nancy Drew looking for deep thoughts. Just a light and fun mystery, which is what The Hidden Staircase delivers. Optimists that they must be, the filmmakers hint in the denouement that this is going to be the first of a series of movies – it seems like they may be setting their sights on the fourth book The Mystery of the Lilac Inn for the next go round. And you know what? I hope they get a chance to make it. 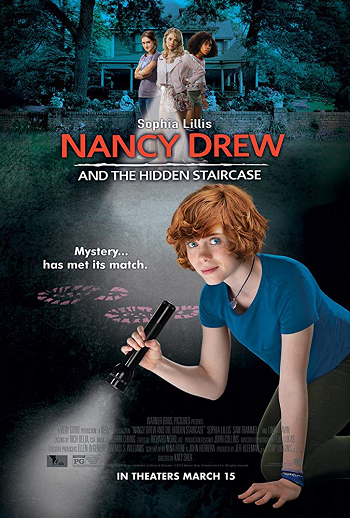 Nancy Drew and the Hidden Staircase is by no means a great movie, but it is mostly enjoyable in its own modest ways. Copyright ©2019 PopEntertainment.com. All rights reserved. Posted: March 15, 2019. Tags: Andrea Anders, Andrew Matthew Welch, Ayanna Wardlow, Evan Castelloe, James William Ballard, Jay DeVon Johnson, jay s jacobs, Jennifer Riker, Jesse C. Boyd, John Herrera, Jon Briddell, Josh Daugherty, Katt Shea, Laura Slade Wiggins, Linda Lavin, Linzy Clifton, Mackenzie Graham, Melanie Leanne Miller, movie review, Nancy Drew, Nancy Drew and the Hidden Staircase, Nina Fiore, PopEntertainment.com, Sam Trammell, Shaun Bowman, Sophia Lillis, The Mystery of the Lilac Inn, Zoe Renee. Bookmark the permalink.